It is with great pleasure that I bid you welcome to the seventh annual Governor’s Symposium. I am very pleased to see so many persons from a broad cross section of our community in attendance as well as our guests from the northern side of our island and from overseas. In particular, I wish to recognize and extend a special welcome to our regional and local speakers who have joined us today. Our keynote speaker, Dr. Kenrick Leslie, from Belize, our featured speaker Dr. Cedric van Meerbeeck, from Barbados, our featured speaker Dr. Michael Taylor, from Jamaica as well as our local featured speakers Mr. Joseph Isaac and Mr. Derek Downes. It is good to have you here at this Governor’s Symposium. The overall objective of the Governor’s Symposia is the promotion of good governance as a pillar for national development. The theme of this Governor’s Symposium: “Climate Change and Small Island States – A call for Strategic Action”, has been chosen because I believe that we are running out of time to implement effective climate change governance measures. On December 12, 2015, the global community, to significantly reduce risks and impacts of climate change, signed the Paris Climate Accord. The accord is aimed at keeping the increase in global average temperature to well below 2 degrees Celsius above pre-industrial levels and to pursue efforts to limit the temperature increase even further to 1.5 degrees Celsius. The realization of the objectives of that accord is especially important for vulnerable small island states like us. The goal of this Seventh annual Governor’s Symposium is to inform our community about the facts and effects of climate change and the urgency for action today, to secure our socio-economic future. As a small island Caribbean state with a one pillar tourism economy, Sint Maarten is in general susceptible to the impact of global events and developments, over which we have no control. In that regard climate change, in terms of its causes, its effects and the responses, presents a major governance challenge. Whereas our contribution to the cause of climate change is not significant, we are amongst the most vulnerable to the threat and effects of climate change. • First, in the context of climate change we have already experienced extended dry weather periods resulting in significant drought. 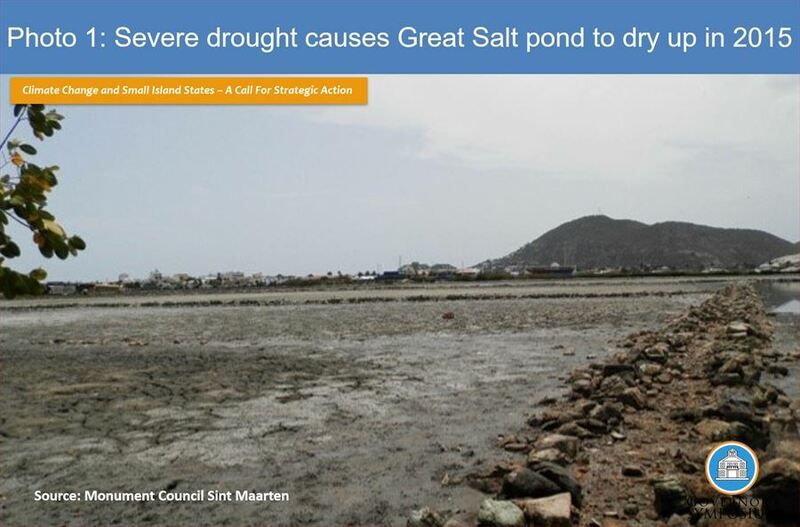 In that regard I can point to the drying up of the Great Salt Pond in 2015 (see photo 1). 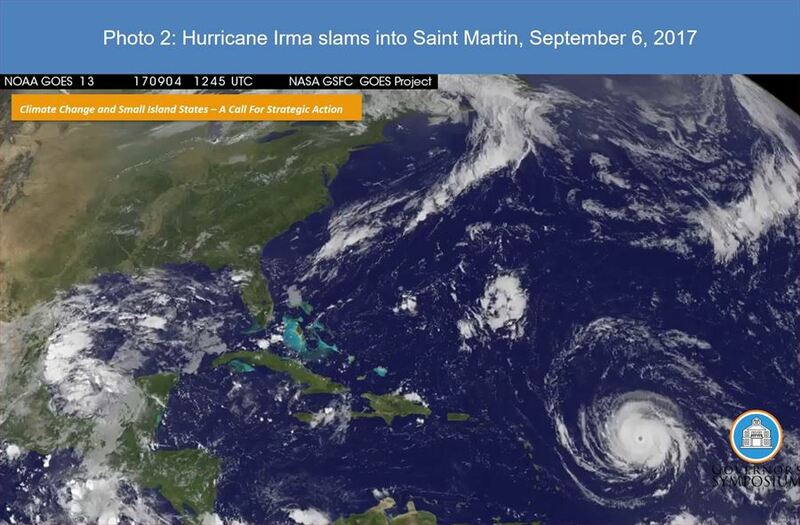 • Second, last year we suffered from the impact and threat of back to back intense hurricanes (see photo 2). I need not remind you of the devastation caused throughout the region by the severity of two unprecedented category 5 hurricanes, Irma and Maria, in the span of 2 weeks in September 2017. The disruption of and impact on the lives of our people is significant. The damage on Sint Maarten is estimated at USD.2.1 billion , almost twice the level of our USD.1.1 billion, pre-Irma GDP . • And third, our coastal and lower lying areas are increasingly vulnerable, as a result of projected sea level rise. A report published by the nature foundation in 2014, shows what Sint Maarten will look like 20 to 50 years from now, if the current estimated rise of the sea level continues (see photo 3). Our Capital Philipsburg, several of our highly populated low lying areas, our tourist area Simpson Bay, our economic gateways the airport and the harbor facilities, Marigot, Sandy Ground and all of our beaches will have disappeared under water and the Low Lands would become a separate island. • do we have the time needed to effect the required strategic action? To address these challenging questions, I invite you to inform yourself about the realities of climate change and its effects. Considering the realities before us I shall conclude by leaving you with some food for thought for a strategic climate change governance agenda. • The first thought is, that climate change should be a strategic priority for individuals, businesses and government. To give content to this, it is imperative to create and establish the required institutional framework and capacity. The establishment of a separate unit responsible for climate change can be an effective step in the further development and implementation of our climate agenda. It is advisable to do so within an existing government agency or ministry. • The second thought is, that the climate change challenge is larger than any nation and requires regional and international collaboration and cooperation. It is therefor logical that regional institutions, such as the Caribbean Community Climate Change Centre, the University of the West Indies, and the Caribbean Institute for Meteorology and Hydrology, all represented here, are working on climate change and sustainable development initiatives. And there are also several United Nations agencies working on climate change adaptation projects in the Caribbean. The suggested national unit for Sint Maarten should be mandated to collaborate with regional and international partners towards the further development of our strategic climate change agenda as part of the regional and international agenda. • The third thought is, that it is critical to increase investments in greater energy and infrastructure resilience and in environmentally sustainable solutions. Essential in this regard, is that the underground cable network project for electricity and telecommunication should be completed without delay. Together with that it is critical to invest in the transition to clean renewable energy generation, such as solar, aimed at contributing to the reduction in carbon emissions and reducing the high oil bill. Moreover, attention should also be directed to climate change mitigation and adaptation investments. This to realize a more environmentally friendly waste management as well as to make our water, hospital, telecommunication, airport, seaport and hotels infrastructure more climate resilient. • And the fourth thought is, that special emphasis should be given to securing financing sources for mitigation, adaptation and reconstruction investments. Specifically, attention should be directed at securing an effective mix of private insurance, national first response funding and a regional disaster risk facility. Climate change poses a real threat to the security and prosperity of our people. We must therefore act now to further strengthen our climate change governance agenda. I say this because time is running out. But I am convinced that by acting now we can save the day for future generations. It is my hope that this symposium will contribute to the required actions, and I hereby, declare this symposium OPEN. Having said that I will like to ask for your attention for the following video to help set the stage for the symposium.